In 2009, I began a new body of work entitled, Tornado Series. Beginning with a group of sketches and oil paintings and now moving into sculpture, the Tornado manifests as an iconic supernatural force. This cyclonic form began to emerge in early bodies of my work as a sign or premonition of Mother Nature’s tools of correction – a counter balance to humanity drive to manipulate and control the planet. Now it rages freely, and while still sickly in our stomachs, as a beautiful entity. Part reliquary and part investigation of the breakdown of our society and belief systems, No Place Left Untouched is as curious to California as earthquakes and tsunamis are to Ohio. 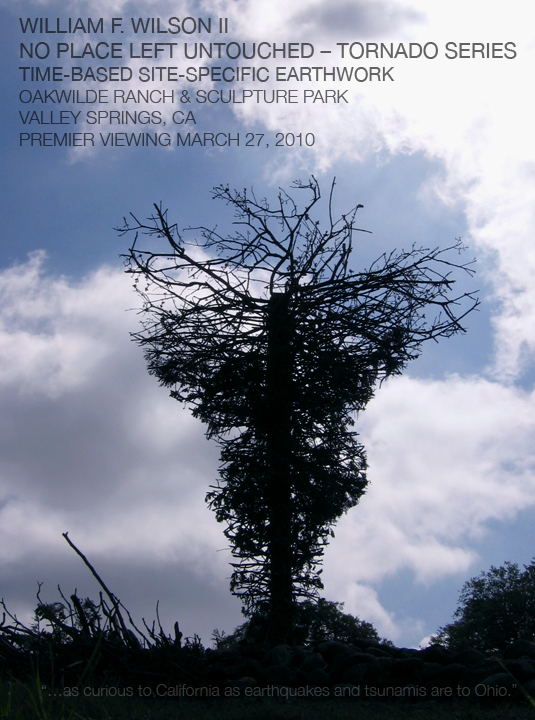 This entry was posted in Sculpture, Tornado and tagged Tornado Series. Bookmark the permalink. Although I don’t like the “real thing” the sculptural version of the tornado evoked the same kind of weariness mixed with curiosity. Only your tornado allowed for safe observation. It is a powerful piece and it will be interesting to see what the elements and time do to it.